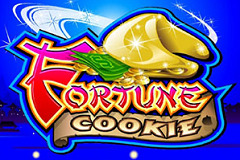 Good fortune is a big part of playing online pokies, and when a classic 3-reel game is called Fortune Cookie, you know it’s going to appeal to lots of players. Fortune cookies are a traditional Chinese snack that diners crack open to reveal a bit of paper that’s meant to predict something about their future, but all that can be predicted about this pokie is that because it’s part of the Microgaming range, it can be relied upon to pay out fairly and will have some nice features to lift it above the average for this type of game. Naturally, there’s a Chinese theme running throughout Fortune Cookie, with a background of a lake at night and a couple of traditionally styled boats bobbing on it, while the font used for the writing is in a format that looks suitably Oriental. Even the paytable columns have little pagoda roofs on them, just in case the theme hasn’t been made clear enough yet. The basic layout is pretty simple and will be familiar to anyone who has tried 3-reel games with a single payline before, but Fortune Cookie has a couple of extra features in store that can bring in additional winning combinations and multiplier payouts. The elaborate game title, complete with a cookie spilling out Dollar bills is topped off with the reels, and a paytable takes up the rest of the area. Below it all are the control buttons that players use to set a coin size, then decide if they want to play with 1 or 2 coins and finally to actually spin the reels. Adjusting the value of a coin from 0.25 to 0.50, 1.00, 2.00, 5.00, 10.00, 20.00, 25.00, or 50.00 is done using the + and – buttons, while the Bet One button lets the player choose the number of coins for a maximum wager of 100.00. The paytable shows how many coins will be won each time symbols line up in the right places, and although it’s split into 2 columns, the amount paid out is in the same ratio as the bet size whether 1 or 2 of them are used. At the bottom of the table, we start with the traditional cherries, where a single example on the payline is worth 2 of them and 2 cherries are worth 5. If a full line of 3 cherries lands across the reels, the combination will pay out 20 coins. Bar symbols also make several appearances in this game, with any combination of them being worth a prize equal in value to 3 coins, and the single bar icon paying 10 coins. If the double bar symbol fills the payline, then it’s a 25-coin reward, while the triple is the most valuable and has 50 coins to pay out when it stops across the line. Lastly, there is a blue 7 symbol, which for some reason has a ring and stars around it, making look like some weird version of Saturn, but frankly, as it’s worth 100 coins, it could look like Uranus and still be welcome. Moving swiftly on and the Fortune Cookie logo turns up with a couple of special attributes that can add a small fortune to a player’s bankroll. Firstly, it’s a wild symbol, so it will substitute for any other if that means it completes a winning line, but if just a single wild and 2 regular symbols land, then the value of the payout is doubled. If 2 wilds and any other symbol are the combination that lands, then the payout is quadrupled, which could mean players getting 400 coins if it’s the 7. But that’s not the jackpot prize, as the wild symbol is also responsible for delivering the biggest payout of 800x should it land right across the line on all 3 reels. A Fortune or a Fail? Chinese-themed pokies are very popular across the world, and Fortune Cookie has a nice design that’s sure to please many punters. Gameplay is fairly straightforward, so much so that many people won’t give it a second glance, but those who like 3-reel games where the aim is to simply spin the reels and collect prizes will find lots here to enjoy.